High-quality data and image capture! The handheld DS6708 combines a 1D and 2D barcode scanner, maximizing employee productivity and streamlining business processes in the retail store, post office, pharmacy or manufacturing floor. The DS6708 reduces capital and operating expenses by eliminating the need to purchase separate devices to read different barcode symbologies. Remote scanner management capability further reduces the total cost of ownership, while multiple interface options makes for easy installation anywhere. USB Kit, 2D Imager. Includes USB cable. Color: Black. USB Kit, 2D Imager. Includes USB cable. Color: White. SCANNER ONLY, 2D Imager. Cables and accessories sold separately. Color: Black. SCANNER ONLY, 2D Imager, ft. Stand. Cables and accessories sold separately. Color: Black. SCANNER ONLY, 2D Imager. Cables and accessories sold separately. Color: White. PS/2 Kit, 2D Imager. Includes 7 ft. straight PS/2 Keyboard wedge cable. Color: Black. SCANNER ONLY, 2D Imager, Drivers License capability. Cables and accessories sold separately. Color: Black. SCANNER ONLY, 2D Imager, Drivers License capability. Cables and accessories sold separately. Color: White. SCANNER ONLY, 2D Imager, Drivers License capability and Invision. Cables and accessories sold separately. Color: Black. SCANNER ONLY, 2D Imager, Drivers License capability and Invision. Cables and accessories sold separately. Color: White. 468x/469x (Port 5) Kit, 2D Imager. Includes 7 ft. straight cable. Color: White. 468x/469x (Port 9) Kit, 2D Imager. Includes 7 ft. straight cable. Color: White. 468x/469x (Port 5) Kit, 2D Imager. Includes 7 ft. straight cable. Color: Black. 468x/469x (Port 9) Kit, 2D Imager. Includes 7 ft. straight cable. Color: Black. Once a technology used in only special situations, 2D barcodes have become more common place. Be it on a UPS shipping label, small electronic devices, documents, or coupons and advertisements, 2D codes can be found everywhere. 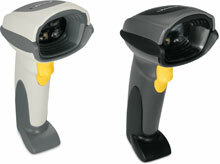 The DS6708 reads any type of barcode and compared to other scanners. The DS6708 also offers an option to parse driver’s license data regardless of state for seamless use with liquor and convenient store POS systems, or any other age verification application. If you have a need to start using 2D codes or the possibility is on the horizon for your business, the DS6708 is a great choice for scanning all types of codes in any application. This scanner is rugged enough to handle the rigors of an inventory environment (back room) while being lightweight enough for the retail side (front room). We have them in both sides of the house. 15', Coiled, standard USB cable, Series A. Wall mount bracket for several Motorola DS and LS barcode scanners. Color: Gray.